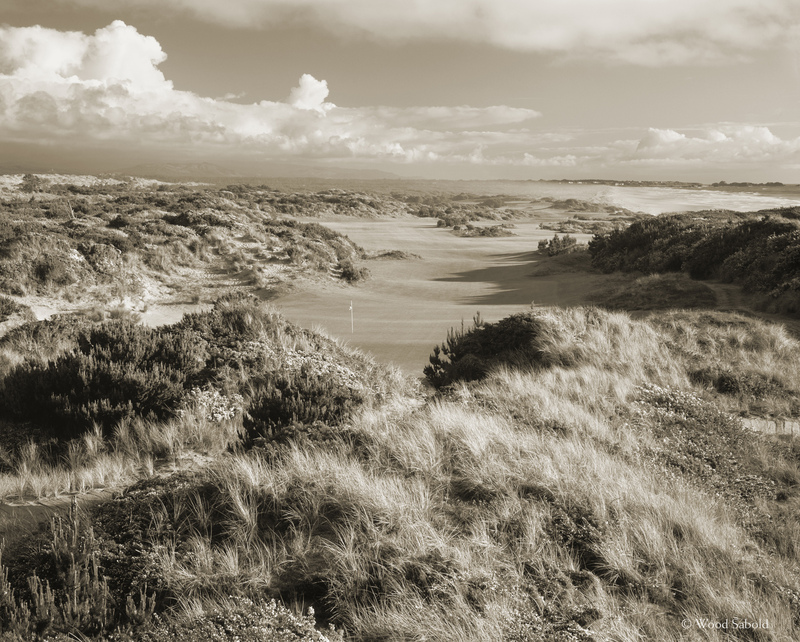 A sepia toned view from behind the green of the par 4 5th hole of the Bandon Dunes Course, Bandon Dunes Golf Resort, Bandon, Oregon. This would become the No. 1 handicap hole of the course with its narrowing fairway as you get closer to the green. The approach shot is like playing through a canyon of dunes, bunkers and gorse. The Pacific Ocean can be seen to the upper right and the seaside town of Bandon By-the-Sea can be seen in the far distance. The Bandon Dunes Course was the first course of the Bandon Dunes Golf Resort. The course opened in 1999. Course architect, David McLay Kidd, DMK Design.